Saccades are rapid eye movements. This page is about too-slow saccades. Follow this link the general "saccade" page. The screen shot above shows mildly slowed horizontal saccades in a patient with Parkinsonism. The main sequence (bottom left) shows velocities below normal for all sizes of saccadic eye movements. 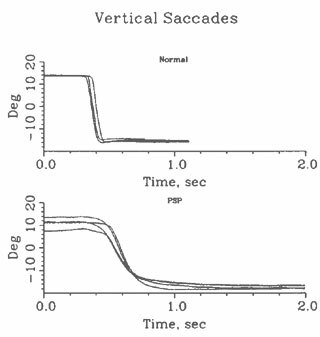 Saccades are slowed in both directions, and latencies are slightly prolonged (on average). Progressive external opthalmoplegia (PEO)-- see movie here. Adrenoleukodystrophy -- a rare MS like disease. PPRF (parapontine reticular formation lesions) such as due to ms (multiple sclerosis) or brainstem stroke. Also see Leigh/Zee 2015, table 13-3. There are three types of disorders of saccadic velocity. Saccades may be too slow, too fast, or have substantially different velocities in one eye or direction than the other. Saccadic slowing is diagnosed when mean saccadic velocity for a particular amplitude is less than the lower fifth percentile of normal. Table 3 lists causes of slow saccades (from Hain, 1993). When saccadic slowing is observed, drug ingestion should be the first consideration. Anticonvulsants, sedatives and sedating antidepressants are the most common culprits. Saccades can be slowed as much as 50% when subjects become drowsy. If the patient is wide awake and not taking a centrally acting medication, then the alternative diagnoses in table 3 should be considered. In some disorders, subtleties of the pattern of saccadic slowing will allow one to further narrow down the list of diagnostic possibilities. One should try to judge whether the slowing involves all saccades, or just horizontal or vertical saccades. Metabolic conditions, such as drug ingestion and drowsiness, cause global saccadic paresis. Most degenerative conditions of the central nervous system that are accompanied by slow saccades; such as cerebellar degenerations, Huntington's chorea, and the chronic progressive external ophthalmoplegias also cause a similar global pattern of slowing. Miller Fisher syndrome, characterized by the triad of opthalmoplegia, ataxia and areflexia is another example. Similarly, brainstem ischemia associated with cardiac surgery occasionally causes a global saccadic paresis (Eggers et al, 2008). Supplemental material: Video of Progressive External Ophthalmoplegia. This patient carried diagnosis of Kearns-Sayre syndrome. Note that while head moves, eyes do not counter-rotate. Selective deficits in vertical saccades. On the other hand, several disorders affect vertical saccades and horizontal saccades differentially. The figure above shows saccades from the same patient with Parkinsonism. Downward saccades are slower than upward saccades as well as of longer latency. Disorders which affect vertical saccades to a greater extent than horizontal saccades include disorders of the midbrain, such as progressive supranuclear palsy (PSP, see figure and movie below), and the ocular muscle involvement typical of thyroid disease. ALS has also been reported to have slowed vertical saccades (Averbuch Heller et al, 1998), see here for more information. Another helpful point that may assist in identification of PSP and related disorders is constriction of range. Examples of disorders which affect horizontal saccades to a greater extent than vertical saccades include focal lesions of the pons such as internuclear ophthalmoplegia, sixth nerve palsy, and in disorders of the lateral and medial ocular muscles. Slow downward saccades in a patient with PSP. These were recorded with a scleral eye coil. Disorders which impair horizontal saccades to a much greater extent than vertical sacades are very rare - -they include brainstem damage associated with pontine hemorrhage (bleeding) or so-far unlocalized effects of cardiac surgery (Vaughn et al, 2008). In internuclear opthalmoplegia, for horizontal movements, the adducting eye is slowed while the abducting eye typically has normal velocity and has a nystagmus. This is covered in much more detail below under the heading of asymmetrical saccadic slowing. For vertical eye movements, the MLF appears to primarily carry posterior canal signals and anterior canal derived eye movements are spared (Cremer et al, 1999). 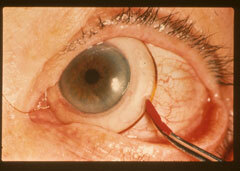 Breaks in binocular fusion may occur in patients with INO (Mills et al, 2008). Cranial nerve palsies - -such as 6th and 3rd nerve palsies usually affect a single eye as well as a subset of eye muscles. Cremer PD and others. Ann Neurol 1999:45:529-533. Leigh, R. J., & Zee, D. S. (2015). The neurology of eye movements (5th edition. ed.). Oxford ; New York: Oxford University Press. Troost BT, Daroff RB. (1977) The ocular motor defects in progressive supranuclear palsy. Ann Neurol 2:397-403.